With many of the roots that make up Nomad Brewing stretching back to Europe, they’ve long looked towards the continent as inspiration when it comes to creating beers, whether in terms of style or just a general approach. It’s the food focused nature of the latter and an openness to beer and food pairing that’s seen them launch the Chef Series in the second half of 2017, a project that will see the brewing company working with notable restauranteurs across the country to make one-off beers. The idea is that these will then feature on the restaurant menus and showcase to a likely new audience how beer can compliment different cuisine. 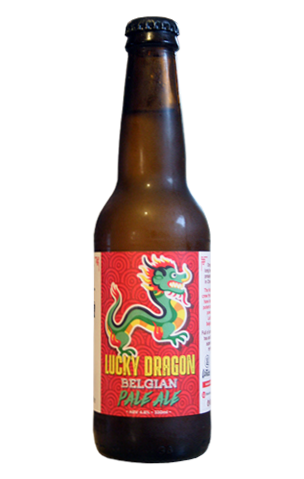 The first in the series is Lucky Dragon, a Belgian pale ale made with and for the Lotus Group, owners of a collection of well regarded contemporary Chinese restaurants in Sydney. Given it’s something to be enjoyed with bao, bing and bun the beer is very light (in both colour and ABV) and isn't going to threaten the flavours of any food it gets gulped down with. But it’s also full of interesting subtleties and ought to be a meal enhancer thanks to Nomad’s customary use of native Australia ingredients; in this case lemon aspen and lemon myrtle, plus jasmine tea, which results in a floral bouquet, citrus on the palate and a slightly dry and acidic finish. While you can't assume the taste preferences of every diner, that’s gotta be a whole lot more appealing than a Tsingtao.